A Korean icebreaker made its way to one of the most remote parts of the ocean in 2011 and 2013, an area near Antarctica and south of New Zealand. There it dredged up material from the seafloor that revealed a previously unknown region of Earth's molten deeps. This 1,200-mile-wide (1,900 kilometers) region was "the last gap" in the geological model of the seafloor, the researchers wrote in a paper published Jan. 28 in the journal Nature Geoscience. 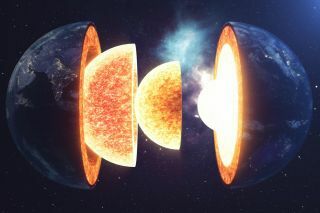 Scientists had predicted that the AAR would have a similar isotopic signature to the Pacific, they wrote, suggesting the two seafloor regions emerged from the same part of Earth's mantle — the hot, rocky region later sandwiched between the crust and the core. Instead, it appears to have burst upward separately from its own part of the mantle, likely as part of a major geologic disruption that occurred about 90 million years ago. That was the end of the period when Earth's landmasses were joined together into the supercontinent Gondwana, with present-day Antarctica at its center. When Gondwana finally broke up, the researchers wrote, a "deep mantle upwelling," which they've dubbed the Zealandia-Antarctic Swell, appears to have pushed its way between the separating continental chunks, forming the relatively shallow seafloor of the AAR. So that's the last part of the ocean's mantle domain identified. But it likely won't be the end of the discussion of how all this new mantle domain and the already-established ones have interacted throughout Earth's deep prehistory to produce the planet we recognize today.